Over the weekend, I stumbled upon and read an epic five part interview with Guillermo del Toro. The interview was an act of passion and del Toro left his DNA all over the screen. He talked about movies and creativity and just about everything. Anything I write would be redundant, so just go read the interview. I watched two movies: Timecrimes [Spanish title: Los Cronocrímenes] and Let the Right One In [Swedish title: Låt den rätte komma in]. I talk very briefly about Timecrimes here, because it is a hard movie to discuss without giving away some of the best parts. Let the Right One In is one of the best vampire movies that I've seen since Near Dark, which is one of my all-time favorite vampire movies. I put off watching Let the Right One In for a long time, because I thought it might be too young adultish for my tastes, but the movie surprised and pleased me. Let the Right One In is that magic combination of plot, characterization, and mood that makes the perfect horror movie. What you don't see is far more frightening than what you do see. So if you're looking to get away from the latest Hollywood remake of the Texas Chainsaw Massacre Part 58 in 3-D with real blood ... something ... something ... something ... watch Let the Right One In. I have a nonfiction book recommendation for you, in case you're looking for a brand new take on the Crusades, check out The Crusades Through Arab Eyes by Amin Maalouf. 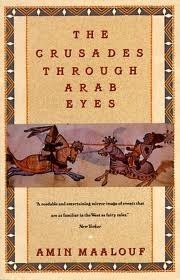 It reads like a novel and gives you an entirely different perspective on the Crusades. European and Arab versions of the Crusades have little in common. What the West remembers as an epic effort to reconquer the Holy Land is portrayed here as a brutal, destructive, unprovoked invasion by barbarian hordes. When, under Saladin, a powerful Muslim army--inspired by prophets and poets--defeated the Crusaders, it was the greatest victory ever won by a non-European society against the West. The Arab version of the Crusades is a heroic story of how the Muslims overcame their rivalries and united long enough to win a holy war. And I know all this makes it look like I'm slacking, but the good news is that I'm almost 9,000 words into In Midnight's Silence and the story is trotting along nicely.